Bouquet at a wedding can not only be in the hands of the bride but also groom and their parents. In addition, if you are there as a guest, you can also give flowers the newlyweds. But in each case bouquet selection slightly differ. Traditionally, it`s a bouquet of roses chosen for this event, although it is not mandatory. If a bouquet for the bride, a lot depends on what kind of flowers she prefers. Just need to know in advance whether she's allergic to flowers that you want to buy. To groom the bouquet should be without any decoration. Flowers should fly upward, as a symbol of masculinity - it can be, for example, roses or gladioli. The look of the bouquet should not be colorful the same as packaging. But for the bouquet as a gift, there`re quite different rules. 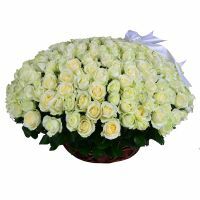 As gift of flowers to high bride will approach a large bouquet, and for the low - more modest. From the flowers, you can choose a universal rose or create something exotic, for example, add orchids to bouquet.